Since you’ve turned 50, you may have noticed that it’s becoming increasingly difficult to lose weight, particularly around your middle. It’s not your imagination. 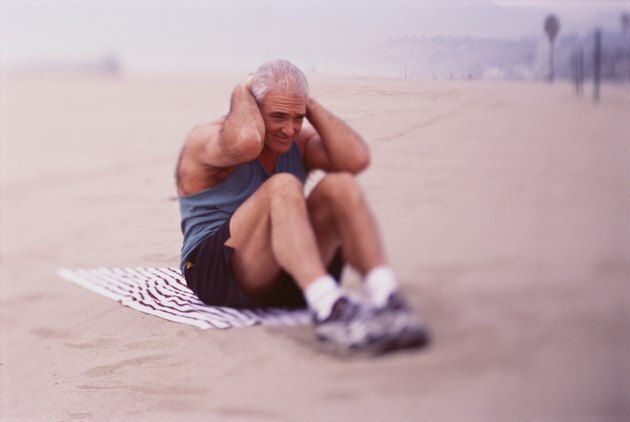 Because your muscle mass declines with age, the rate at which you burn calories decreases as well. 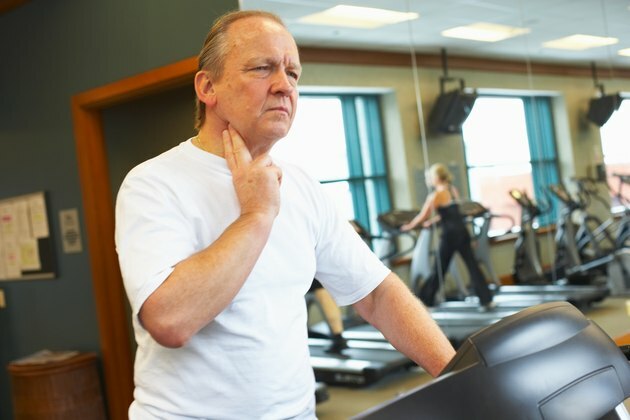 To complicate matters further, lower levels of testosterone in older men and dwindling estrogen levels in post-menopausal women can cause your weight to balloon. All is not lost, however. With knowledge and discipline, you can lose fat -- abdominal or otherwise. 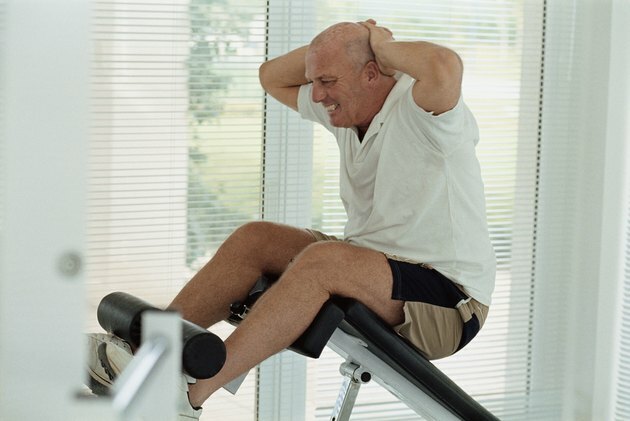 Being active is the key to burning fat, particularly when in your mid-50s. While you cannot “spot reduce” abdominal fat, if you burn more calories than you consume, you are certain to lose weight, including on your belly. People over 50 should engage in at least 30 minutes of moderate aerobic exercise, such as walking, stationary cycling or swimming, every day. To maximize your fat-burning potential, determine your fat-burning target heart rate. According to the “Fitness After 50” newsletter, you can determine this rate by multiplying your maximum heart rate -- 220 minus your age -- by 55 percent and 65 percent. While exercising, you’ll want to keep your heart rate between these numbers. Weight lifting and other forms of strength training are essential for people over age of 50, especially those looking to burn fat. Strength training helps build muscle mass, which helps your body to burn calories efficiently even while at rest. 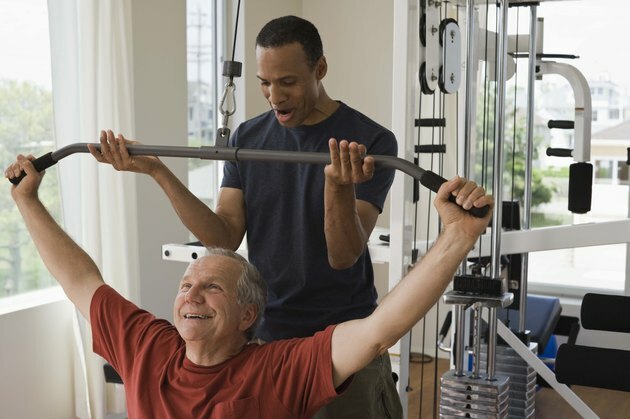 Because muscle mass starts to decrease after age 25, your body won’t burn calories as efficiently by age 55 -- that is, if you haven’t taken steps to preserve your muscle mass. Start with two weight-training sessions per week, lasting 30 to 45 minutes. Weight strength varies with experience, but you should try to work your way up to using weights that tire your muscles after 10 to 12 repetitions. Contrary to popular belief, abdominal exercises do not target abdominal fat. They do, however, help tone abdominals and keep them strong. Performing abdominal exercises in conjunction with fat-burning routines can help turn your stomach from flabby to fit. In addition, ab exercises strengthen your core and your back. Try to perform 10 daily repetitions of abdominal exercises, such as crunches, reverse crunches, obliques or the bicycle. Interval training is a good way of maximizing your fat-burning potential. Interval training rotates cycles of high-intensity and low-intensity exercises within a single workout session. 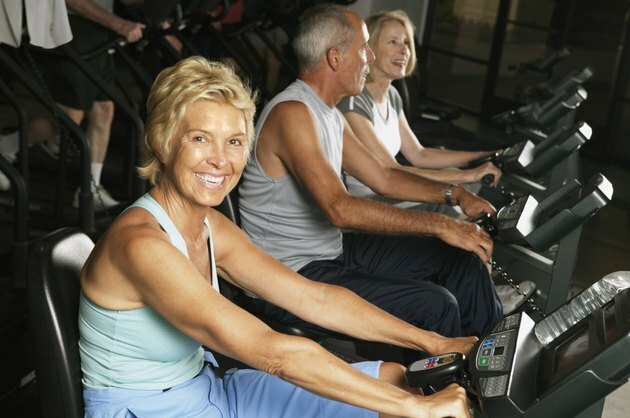 For example, you might ride the stationary cycle at a moderate for five minutes, increase top speed for one minute and then reduce to your original speed for another five minutes. You can alternate your speed in this manner throughout your entire workout. You’ll burn more calories when you exercise more intensely, even if you’re not working out at the highest levels for the entire session.